Eric Carle’s Grouchy Ladybug made its literary debut with a self-titled book (The Grouchy Ladybug) in 1977. Feisty, arrogant and hotheaded Grouchy Ladybug has anger management issues and foolishly tries, as the time clicks by, to pick fights with increasingly larger animals: yellow jacket, beetle, lobster, skunk, hyena, rhinoceros, etc. After challenging various parts of a whale, the whale’s tale flips that little ladybug right back to the leaf on which it started out its grouchy day. 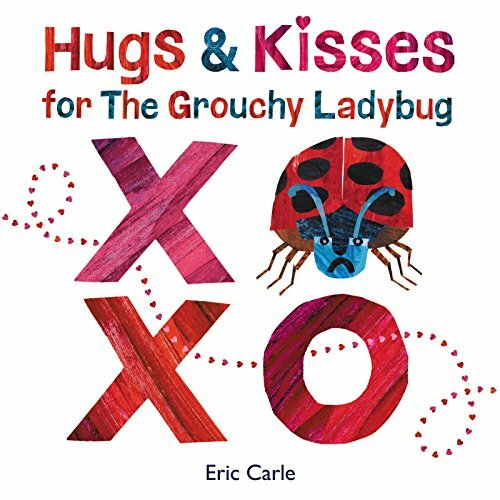 Hugs and Kisses for the Grouchy Ladybug is a much different adventure. Instead of fights, Grouchy Ladybug encounters hugs and kisses among the animal kingdom. Instead of ending up starving after a long day’s journey, Grouchy Lady now feels less grouchy. And instead of a long narrative, elaborate page cutouts, and an educational link with the o’clocks of the day, Hugs and Kisses is a super simple 45-word exercise in minimalism. Grouch Ladybug is perfectly cast in its role in Hugs and Kisses, although it is grouchy in name only, there being nothing else to indicate its disposition. Nothing from its previous escapades is continued here. Even so, who better to be transformed by loving kindness and affection than a stubborn grump. As Grouchy Ladybug cruises around it witnesses the effects of hugs and kisses on various animals. Crocodile smiles, kangaroo jumps, giraffe stands taller, peacock struts, bear “feels warm and fuzzy.” The emphasis is on the transformations that result from being shown a little bit of affection. Everyone feels grouchy from time to time and preschoolers will easily recognize this common emotion. Readers will watch as the Grouchy Ladybug’s face ultimately changes from a grimaced frown to a relieved smile. Youngsters will feel empowered with the ability to change someone’s day for the better by giving the very things that they possess in abundance. For anyone struggling with a bad day, no matter who they are, feeling loved can make all the difference. In classic Carle style, each animal is a collage of hand-painted paper full of personality, energy and emotion. Plenty of white space allows for appreciation of the nuances of the artwork and the subtle interaction between each animal and Grouchy Ladybug. Hugs and Kisses for the Grouchy Ladybug is simple, lovely, effective, and well suited to the youngest of readers.